Loved their remake. I see Oscar nominations for both actors. Music was great. I had no idea Bradley Cooper could play and sing! Lady Gaga was amazing and so much prettier without all the makeup. I knew the story going in and I think they did a good job with it for our current time. Walked out middle of the movie, such a disappointment, language is disgusting, F word all through the movie. I was excited to see the movie but the excitement turned to disappointment. I did not enjoy the movie and could not get past Gaga and her meat dress, etc. While a brilliant singer, she left me disappointed. Cooper's direction was somewhat choppy, but he is truly a star no doubt. Overall the movie was a disappointing 2 star. no chemistry between actors. Kinda boring. As a fan of the 1950's version of A Star Is Born, I was interested in how they would update the story and situations to the present day. I can say, it was a pretty good adaptation. Cooper is awesome and Gaga is excellent. Both seem to be really enjoying the chance to flesh out their roles. My biggest complaint is that as Gaga's character rises in fame, she becomes a version of Gaga herself - this gave me a bit of a disconnect with the story. I would have liked to see her turn into a rock star and not a pop sensation. Besides that , it was quite a good movie - I wouldn't say amazing but very good. To compare, I felt pretty much the same way I did coming out of Moonlight a few years ago. The music in this movie is amazing. They both gave excellent performances. I would definitely recommend it. Bring your tissues. The star is for the cute dog. Read he’s really Coopers dog. Sorry but I hated the movie. It was ok. Not great but ok. Singing was the highlight. Awful movie in every way. Bad bad bad. BORING. A real yawner. One star is too much praise. Honest. Don’t waste your time and money on it. 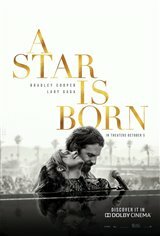 After a terrific start with an uplifting if rather quick elevation to stardom for Gaga by star Cooper and great songs, the movie just got sad and lost focus playing on sympathy for alcohol and drug addiction. I would tell people to watch the first half hour then leave and get your money back. Great dog though. Omg!!! I’m telling ppl to see this ???? I'm not sure why people gave this movie 5 stars. The music was good and Lady Gaga and Bradley Cooper sang well but the movie was too long and was boring. Real Oscar nomination performance. Cooper is unbelievably talented. Great movie! Performance is excellent! Music was great but which I had not seen this movie. Read Varieties Excellent review. The only thing missing was stating that we were witnessing the birth of a star: Lady Gaga. Also, Coopers growth as an artist makes this decade his: lock, stock and barrel. I don't know why such fifthy language has to be in the movie. I would have enjoyed it more without the F word. It's the worst word in the English language!!! Lady Gaga IS the Barbara Steisand of 2018 !!! She has an AMAZING voice. Loved to see her spared down dans makeup ! Her acting for a first movie ever was pretty darn good ! Bradley did a great job too, singing, acting & DIRECTING ! What can't those two do ??? We all knew the story going in. Kept me engaged the entire movie ( that's all I ask ). Worth seeing just for the music alone. Wanted to see more of Sam, Dave & Andrew ( so great as the father ! ) Worth every penny ! Very good performances by Bradley Cooper & Lady GaGa, but i don't think i would see this movie again. A little bit disappointing. I have to say, though the music was very good. Loved the music, but why do they have to swear so much? Made it low class. As much as I loved the Streisand/Kristopherson version. I also loved this one. It stood on its own. Great cast, great chemistry, wonderful music, great cinematography. All that and Sam Elliott. What's not to like. Amazed at the 5 stars people have given for this movie! It was too long, too drawn out and boring, with unnecessary bad language which did nothing to enhance the poor plot. Yes, Lady Gaga and Bradley Cooper can sing, but their characters evoked no empathy. One of the few movies I have seen that I could not wait to end. The dog was cute. Such an amazing movie, powerful & emotional, great chemistry and beautifully acted by all, a must own for me once it releases on blu-ray, can't wait to watch it again! This is a great movie, or remake. All four of the movies have the same theme, but are different for the eras made. I have seen all four and loved all four. With that said, I could not believe, because of the superb acting, I cried. Very disappointing - couldn’t get past the bad language.